At Rock My Run we’re constantly working how to make it easier for you to find killer running music mixes to help keep you motivated during your workout. So naturally, we’re pretty excited to announce that we have added a few new ways for you to sort through our awesome running music mixes! Now in addition to filtering by genres, length, DJ’s and lyrics, you can now see what mixes have been performing best on the site by clicking on three new sort orders: Highest Rated, Most Downloaded and Hottest. This last one is cool because it tells you what has been most downloaded in the past 30 days – it’s a nice combination of what’s new and what’s popular! Plus we have also added a way for you to see when your next FREE Rock My Run credit will arrive so you can get that next mix you’ve been eyeing. All you need to do is log into RockMyRun.com and click the “My Account” link in the top right. 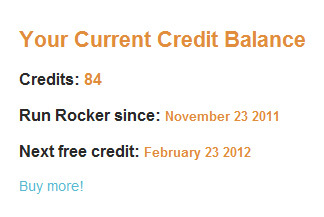 Not only will you see the mixes you’ve already used credits to get access to but you’ll see your Rock My Run credit anniversary. 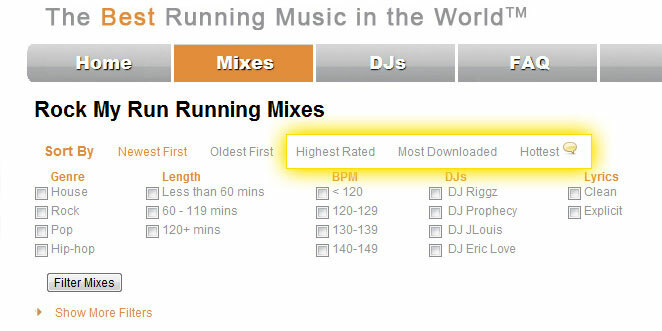 Hopefully these additions will make it even easier to find the right running music mix for your next run. If you have suggestions on how we could improve, let us know!